Owner: HM Queen Elizabeth II, U.K. 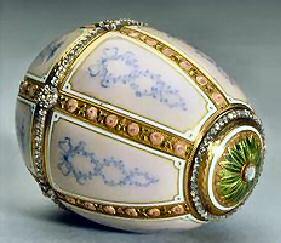 The 1899 Kelch 12 Panel Egg is made of yellow gold, rose-cut diamonds, portrait diamonds, translucent pink en green enamel and opaque white enamel. 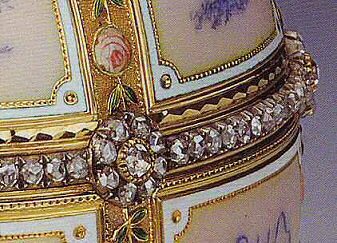 The upper and lower sections of the Egg are each divided into six panels by bands of matt-finished gold, overlaid with rows of pink enamel roses with gold stems and translucent green leaves. A band of rose-cut diamonds set at intervals with rosettes of additional diamonds encircles the Egg at its widest part. 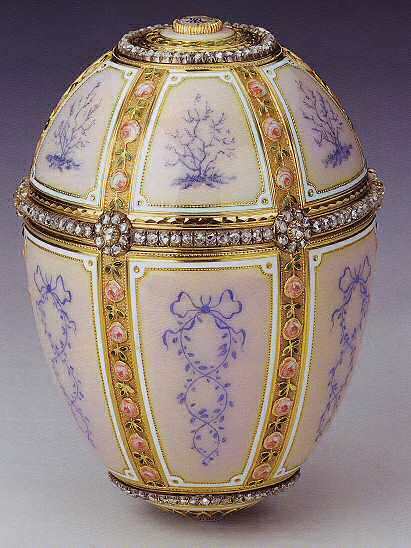 Each end of the Egg is finished with concentric circles of diamonds, gold and green enameled leaf motifs and pink enamel. the top end is centered with a medallion bearing the initials B.T.K. in script under a portrait diamond; the other end has a similar, though smaller medallion showing the date "1899". The surprise has been lost. In 1899 presented by Alexander Kelch to his wife Barbara. Somewhere in the 1920's bought by A La Vieille Russie in Paris, probably from Barbara Kelch. In 1933 sold by A La Vieille Russie, Paris to (probably) a buyer from England. Christmas 1933 presented by King GeorgeV of England to Queen Mary. 1953 inherited by Queen Elizabeth II.